When I visited UCSB for the first time three years ago at Spring Insight, I roamed the campus on a foggy day with my family and saw the organizations lined up near Pardall Tunnel. I loved going to the aquarium at Campus Point, relaxing at Goleta beach, and learning about study abroad programs. Looking back, I remember how the campus seemed so foreign and spread out when I was a freshman. I’m a senior now, and it’s hard to believe that graduation is in 11 weeks. I feel a mix of relief that I won’t have to deal with the quarter system anymore, and unease about what to do after college. Finding an adult job is a daunting task, and it’s hard to imagine my friends from university going to different cities after college. After graduation, I’m leaving Santa Barbara, so I want to make the most out of spring quarter. Winter quarter passed by so quickly because we only had nine weeks of classes; one week made such a difference. Whether you are a senior or not, here is a bucket list to motivate you to explore and enjoy everything that Santa Barbara offers. With spring season upon us, there will be no excuses for not going to the beach. Last winter quarter, the rainy and cold weather may have deterred some students from relaxing and tanning in the sunshine. The high levels of bacteria in the ocean due to the mudslides also kept many surfers out of the water. On a sunny day, make the trek towards Coal Oil Point, Sands Beach, or a beach downtown to enjoy the outdoors. This is when you and your friends drink a pitcher of beer at several places in I.V. around Embarcadero Loop. Woodstock’s, Sam’s to Go, and Dublin’s are a few places that are a part of it. The Loop is a fun way to sip on some beer, visit your favorite restaurants and bars in Isla Vista, and spend time with friends. One thing is for sure: you better take friends who like beer. Extravaganza is a fun, daytime music festival that Associated Students puts on and that Gauchos look forward to every year. Last year, Tinashe, ScHoolboy Q, and Griz were a few headliners. Sadly, I didn’t even go to Extravaganza my freshman year because I didn’t know that it was such a big deal at UCSB. What’s not to love about this free, mini festival at Harder Stadium? Spring is the ideal time to hike in Santa Barbara; there are some great trails in Montecito (south of UCSB) and Gaviota (north). Sadly, a lot of the Montecito trails are closed, but don’t worry because there are other ones to explore. If you drive north of UCSB, you can hike up Gaviota Peak or Gaviota Wind Tunnels trail. Gaviota Peak is a 6.5-mile loop with beautiful views of the ocean. Or if you want to see wind-carved caves that overlook the mountains and oceans, try Gaviota Wind Tunnels. Solvang is a quaint Danish town about 45 minutes north of Santa Barbara where you can eat pastries to your heart’s content. You can also visit a nearby ostrich farm, wine taste, visit the museums, and ride the trolley car around town. 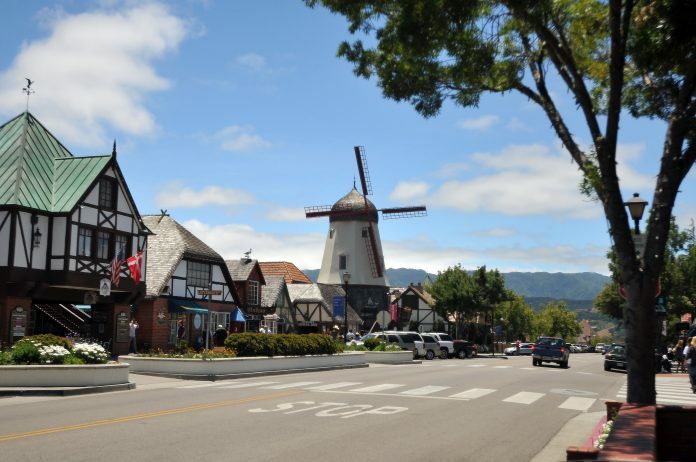 Solvang is like a mini-Copenhagen, minus the expensive, long-haul flight to Europe, so it’s certainly worth the time to make a day trip with friends. There are a few rooftop bars scattered across downtown that provide beautiful views overlooking Santa Barbara. One is the Kimpton Canary Hotel, which looks out over the hills of Santa Barbara, and Finch & Fork has a rooftop bar scene with 360-degree views. Experiencing the luxury of rooftop class will change things up from the usual downtown club scene at Wild Cat or EOS. Although the climbing wall in the MAC is free for UCSB students to use, many people have never tried it. You just have to pay for climbing shoes and the harness. For your first visit, you can rent the shoes for free and rent the harness for $5. The price seems worth the challenge and the chance to brag that you conquered the climbing wall. The wall has a bouldering section, 30-foot main wall, and top rope climbing that you can try after class one day. Looking back, I’m so thankful for my past four years at UCSB. Although it has been tough to juggle extracurriculars, classes, friends, and work, the hard work pays off. With this bucket list in mind, I hope Gauchos enjoy the rest of their undergrad days at UCSB. Thanks. Now I want to go check out the Wind Tunnels. Well done! Please take us to all these places. How are the trails rated ? Any I could handle?